Unfortunately, I couldn’t find a grill cover that was not made of vinyl. As a green gal I'm not thrilled with vinyl to put it nicely. And if I had to go with not environmentally friendly vinyl as a last resort I want one that is sturdy and last forever so I don't have to replace it because the remains of my ripped grill cover are going to last forever in the landfill. I could not find anything remotely sturdier (or nicer looking) than the grill cover Mother Nature trashed. I don’t want to send countless vinyl grill covers to the landfill every two years. Going without isn’t an option if I want my grill to survive winter. 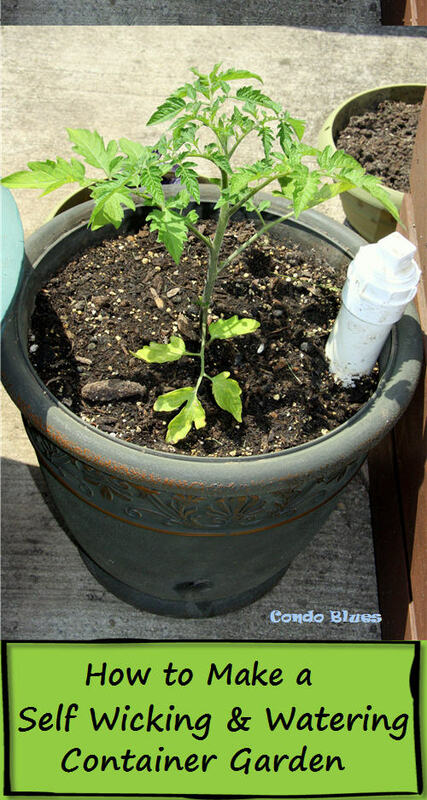 Part of our green practices is to take care of our stuff so we don't have to spend extra resources replacing it. That practice saves money too - a twofor! 1. Use the scissors to cut the old grill cover apart at the seams. 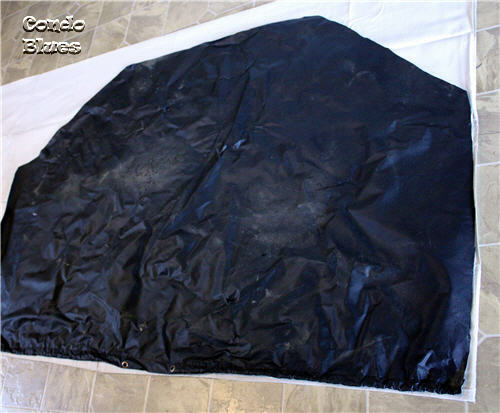 You will use this as your pattern to cut the new grill cover pieces from the drop cloth. 2. Fold the drop cloth in half. Lay the pattern pieces on the drop cloth. 3. Use the scissors to cut two grill shaped pieces for the front and back of the grill cover and one rectangle piece for the top and sides of the grill cover. 4. 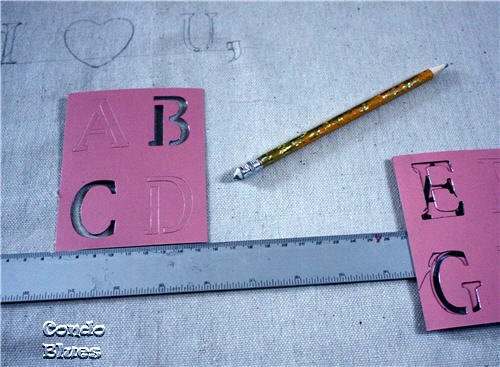 Use the ruler and pencil to draw straight lines to use as a guide for your stenciled letters if desired. I am taking my decoration inspiration from one of my favorite I Can Haz Chezeburger LOLs. 5. Trace where I want the stenciled letters to appear on the grill cover because I am bad at eye balling stencil spacing and placement with paint. 6. 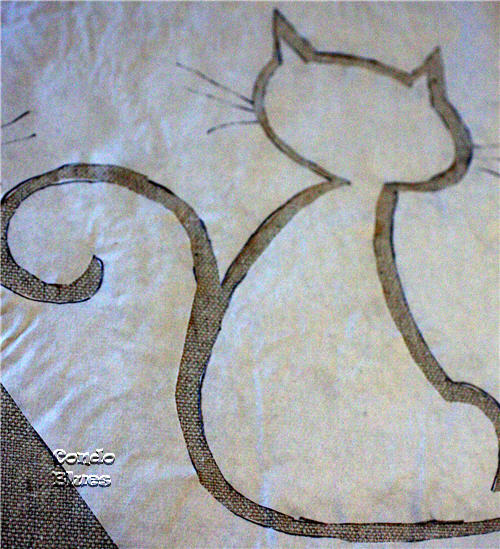 Make the cat stencil by placing the cat artwork underneath the freezer paper, tracing around the design with a pencil. 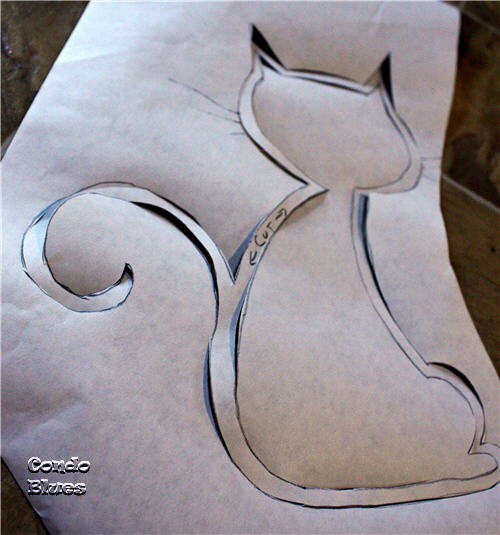 Use a craft knife to cut the stencil out. 7. Iron the freezer paper cat stencil shiny side down to the drop cloth with a warm iron. My iron was too hot and wrinkled the freezer paper too much. Don’t be me. 8. 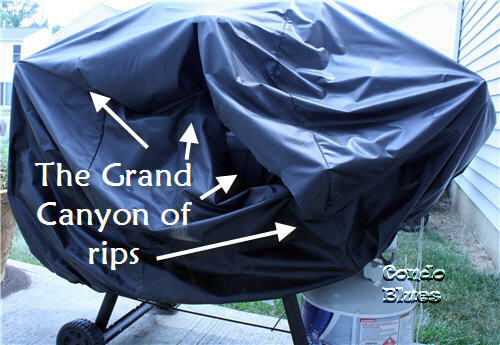 Repeat Steps 4 – 7 for the other side of the grill cover. 9. Stencil time! Tape the cardboard letter stencils to the drop cloth with painters tape. Place the paint dauber caps on the paint bottles. 10. Stencil it! 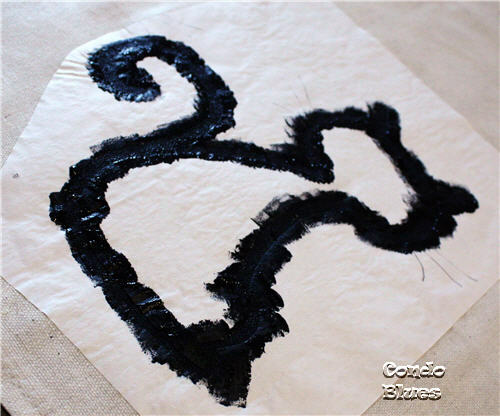 Lightly dab the stencils and canvas with paint. It is better to do several light passes of paint than one thick pass of paint or the paint may seep under the stencil (guess how I know?) Carefully remove the stencil from the letter while the paint is still wet. Tip: To keep the project moving. I painted every other letter in the words. When I finished with the sentence, the stenciled letters were dry enough to allow me to stencil the letter next to it without smudging the paint. 11. 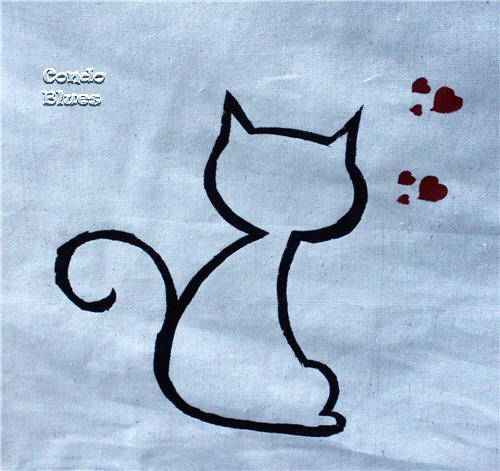 Use the same dabbing technique to paint the cat stencil. 12. 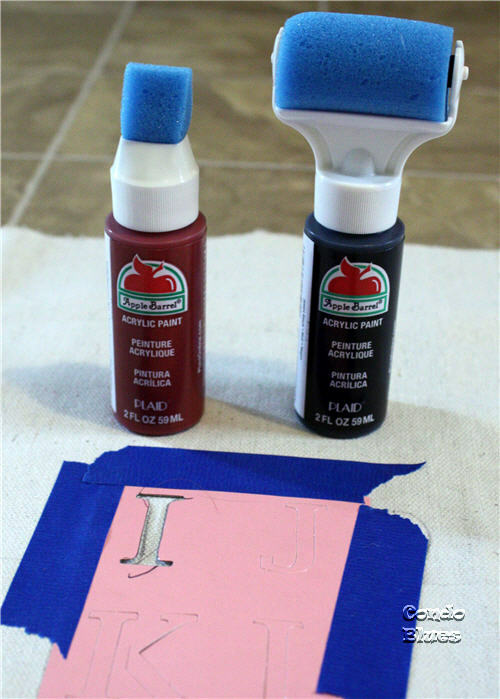 Carefully peel the freezer paper stencil from the drop cloth while the paint is still wet. 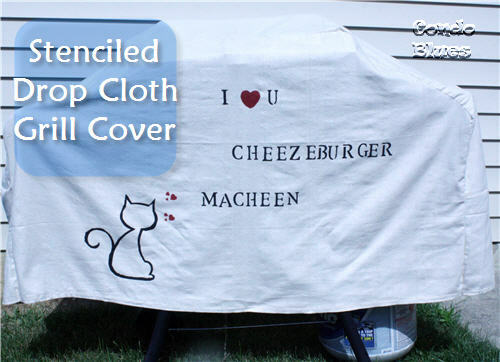 Optional: Stencil cheeseburger loving hearts around your kitty. I used a Plaid Martha Stewart Craft stencil I already had for the happy hearts. 13. After the paint is thoroughly dry, use the straight pins to pin the center section to the front and back sections of the grill cover right sides together (the painted part) using your old grill cover as a guide. 14. Use the sewing machine and thread to sew the grill cover together removing the straight pins as you sew. 15. Turn the grill cover right side out and water proof the painted design with Outdoor Mod Podge. Allow the Mod Podge to dry. 16. Cover up that grill and dare Mother Nature to BRING IT ON! I can haz sturdy and cool canvas drop cloth grill cover. Great job - i love the LOLcat factor! And, I can't wait to see what you do with the woodburning tools! Nice Post and like the step by step process! I would have never thought of a grill cover, it looks awesome! Lisa I really love this! So funny! 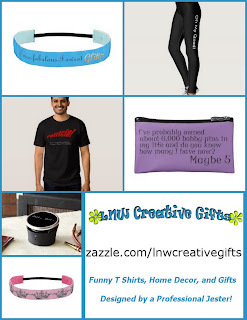 I'm a huge LOL cat fan - I have an "I can has awesomes" t-shirt! functional and crafty and fun! 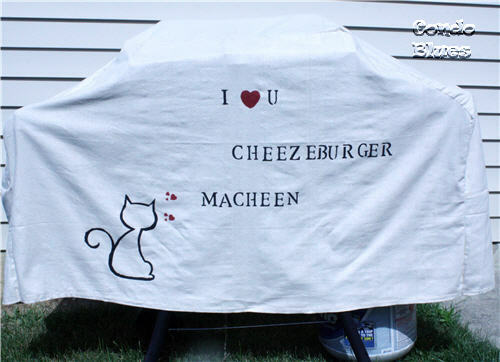 Husband and I can't walk past the patio door without saying I luv u cheezburger macheeeeeeeeeeeen. The same thing goes when we pass a Cheeseburger in Paradise Restaurant. This is just what I'm needing today! Our grill cover was whipped about by an East Coast wind, and then there are the kittens that are poking holes in the new one! Bookmarking this.....thanks for sharing! Love the LOLcat cover! My first big laugh-out-loud of the day. Thanks, Lisa! I love this. Though at my house, it would need to be "I can has a hotdog?" Thanks for sharing on Tout It Tuesday! Totally adorable and the cutest grill cover ever! this is great! our grill cover bit the dust YEARS ago!! This is great! Love that Cheezeburger Macheen!